Of the first, a glance will show you extensive remains of the monastery along the valley floor. The surrounding land has recently had deep drainage ditches cut, so perhaps the land is no longer quite as boggy as in previous years — at least the many cattle contentedly grazing in the summer sun weren’t complaining. The mill is gone, but the walls of the mill race still stand. This must have been a true wonder of monastic Ireland, because there is no stream flowing into the Fore valley. Instead several springs and wells bubble up (due to the presence of a large lake, Lough Lene, in the next valley over). The legends state that St. Fechin, founder of the abbey, built a mill beside it and caused the water to rise up out of the ground to turn the wheel by striking the rock with his staff (a trick he must have picked up from Moses). Regardless of the literal truth of this foundation myth, it was a clever bit of engineering to wall up the spring into a mill pond, and the mill was a going concern until the late 19th century. As for the water flowing uphill, after the water leaves the mill pond, it meanders around a boggy field before continuing down the valley. As you walk down a very slight slope from the mill towards the monastery, the stream turns back and flows in a semi-circle around the field. This, according to one old woman we met on site, is the legendary water that flows uphill. None of us was convinced, but you could see where the idea came from. Some of the less inappropriate “decorations” on the rag tree. The tree that will not burn was an ash that grew over St. Fechin’s Holy Well. The small tree that grows there now is said to be grown from a branch of the original. 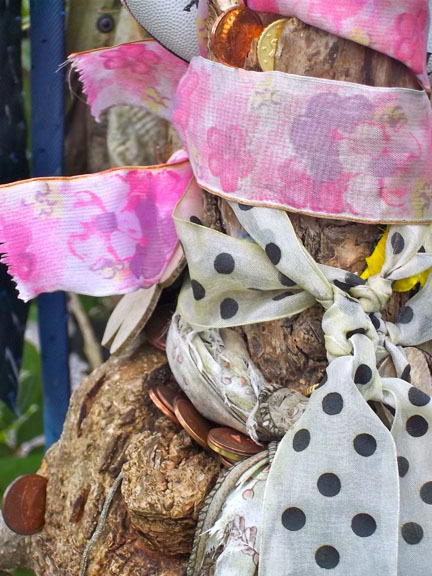 Like at most holy wells, this is a rag tree, to which people have tied clotties, strips of colored cloth that denote wishes or prayers they want answered. Sadly, the tree is sagging under the weight of many inappropriate offerings. Socks were common — perhaps because people didn’t have the foresight to bring spare ribbon? Pieces of clothing, underwear, shoes, and many items I’d simply call trash were also tied to the branches. 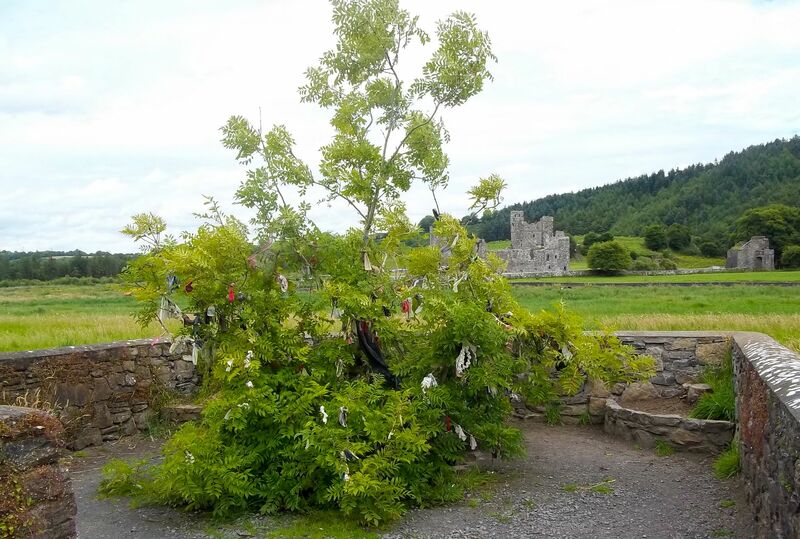 Many rag trees in Ireland can be beautiful in May and June, but this one seems to attract a less scrupulous pilgrim than others. 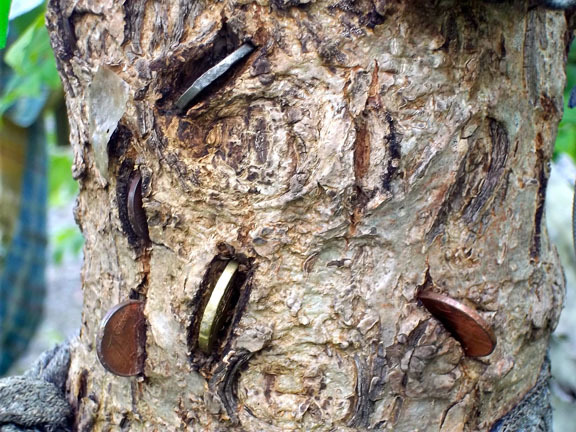 Coins embedded in the bark of the rag tree. A tradition attached to Fore is for people to push a coin into the bark of this tree as an offering. The cynic in me suspects that this might be why the wood on the original tree didn’t burn — it was mostly metal. This tradition is still in evidence, if you can see through the shroud of rubbish tied to the branches. St. Fechin’s well has sadly silted up, so it wasn’t possible to test the water that doesn’t boil theory. There appears to be a second well on the site, but that one has been badly damaged, possibly by tree roots undermining the walls, and the enclosure is now heavily littered and the stone walls unsafe, so it’s best avoided. A later 15th century church on the hill overlooking the abbey boasts an anchorite’s cell in the tower. Once upon a time a devout monk would enter this room vowing never to leave it until he died. The church is kept locked, but the key can be obtained from one of the pubs in the village. We didn’t have time to investigate if there is a current occupant in the anchorite’s cell, but I am curious to return someday and discover if 15th century hermits had more or less space than the typical freshman dorm room. The lintel stone of the original 7th century church still stands above the doorway, marked by a simple early-Christian cross in a circle. It is very large, and according to legend St. Fechin moved it into place through the power of prayer. We’ll have to take that one on faith. This simple church is now in ruins, but still boasts an interesting carving of a monk at prayer, and an immense stone carved baptismal font, showing that even in apparently ordinary ruins there are impressive historical treasures to be seen. 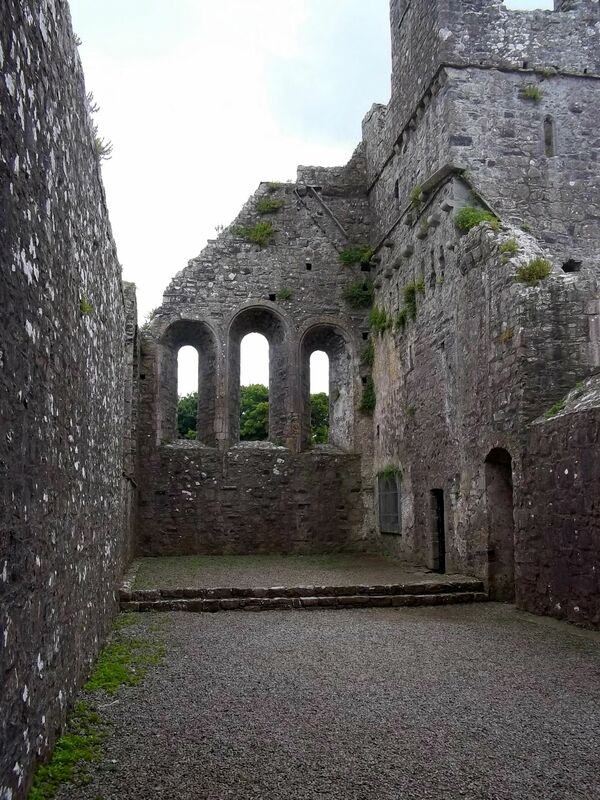 My children thought the Abbey was a wonderful place, as the extensive ruins have been stabilized and repaired, but there are still many broken walls to climb, stone stairs, and second-floor rooms accessible only to determined and agile climbers. From the number of other families enjoying a picnic among the ruins, I suspect the opinion is shared by many kids in the surrounding area. 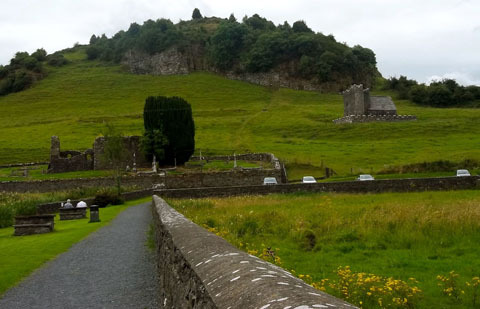 The hill that overlooks the monastery can be climbed, and great views enjoyed from the top. Some helpful interpretive signage helped me get the most out of the visit, and the little cafe/information center in the village that supplied both further information and much-needed ice lollies was the icing on the cake. On the left, half-hidden by a large yew tree, stands the oriinal 7th century church of St. Fechin. On the right, the 15h century anchorite’s church. All in all, Fore Abbey is a great place to spend an afternoon exploring with your family. Looks fabulous, thanks for the heads up.